According to the EPA, stormwater is one of the largest pollution sources faced by many of our lakes, rivers and streams. Whether it’s called stormwater, polluted runoff, storm drain discharge, or just plain runoff, the definition and effects remain the same. Stormwater is the rain water or snow melt that picks up pollution from hard, impervious surfaces, such as roads, parking lots and driveways, and washes into our waterways, usually via storm drains. Back before much of our land was developed, rain would fall from the sky and soak into the ground, where microbes could clean and purify it, and it would replenish groundwater supplies and feed rivers and streams. Now that our landscapes are blanketed in development – houses, parking lots and streets – the water no longer has a chance to soak into the ground, but instead delivers pollutants to waterways . What pollutants are in stormwater? Consider what water contacts from the moment it falls to earth to the time it is discharged into lakes, rivers and streams. Litter, lawn pesticides, herbicides, fungicides, excess nutrients like phosphorus and nitrogen, dog waste, bacteria, byproducts of car exhaust, oil, excess sediment, snow and ice-melt chemicals are all possible water contaminants. How do we protect our waterways from stormwater? The easiest and best way to treat stormwater is to let it do what it once did – e.g., soak into the ground so that microbes can break down the pollution and clean it up. However, over the centuries, and especially over the last 50-75 years, community landscapes have been designed to direct water across the landscape as quickly as possible, with little to no regard for treatment, before discharging it into local waterways. Fortunately, the focus now is to use “Best Management Practices” to treat and clean stormwater before the water is discharged into streams, ponds or rivers. Best Management Practices (BMPs) either can be structural or non-structural. 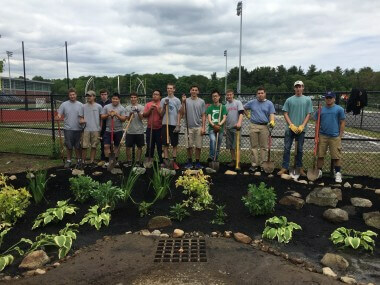 Newly installed rain garden at Xaverian Brothers High School in Westwood. Click here for information on preventing residential stormwater pollution. Over the last couple of years, the Watershed Association has worked with several towns to site structural BMPs and implement non-structural BMPs in an effort to minimize the effects of stormwater pollution in the Neponset River Watershed.